The Gingerbread Village is open! Each year the Sheraton Hotel’s culinary team partners with local architectural firms to design elaborate gingerbread creations and stage them in the hotel lobby at 1400 Sixth Avenue. The viewing is free and is open 24 hours per day from now through January 5. 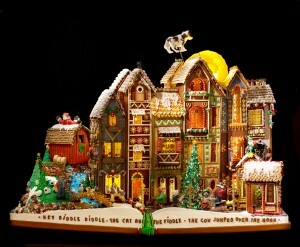 Donations are accepted at the Gingerbread Village to fund the Juvenile Diabetes Research Foundation. This year’s Gingerbread Village theme is “Jingle All the Way.” Come and see how favorite holiday songs have been brought to life in gingerbread creations.